FILE - Brazilian federal judge Sergio Moro reacts during a session at the Federal Senate in Brasilia, Brazil, Dec. 1, 2016. A shy federal judge based in a provincial capital has become an unlikely celebrity in Brazil, where he is shaking up the nation's power structure while overseeing what may be the largest corruption probe in Latin American history. Passers-by mostly cheer — but sometimes jeer — Sergio Moro when he goes into restaurants. Concert-goers break into applause when performers point him out in the audience. Tourists are bused in to gawk at the office where he works in the Parana state capital of Curitiba. Many Brazilians see the 44-year-old judge as a hero who is cleaning up a nation plagued by corruption, while critics accuse him of unfairly targeting figures from the leftist Workers Party government that led the country from 2003 until mid-2016. Over the past three years, Moro has been instrumental in the so-called Car Wash probe that already has sent dozens of top businessmen and politicians to jail and is still expanding. "The Car Wash investigation could not have just one hero. There are judges, prosecutors, detectives," said Igor Romario, the lead federal police investigator on the case. "But Moro is the center of it. Without him, we wouldn't be where we are." Friends, colleagues and journalists who have covered the case closely say Moro is a deeply private man — a law wonk who voraciously pores over legal cases in several languages. He's noted for writing meticulous legal decisions — much faster than most Brazilian judges do — that are rarely overturned by higher courts. "We are talking about the best lawyers, the most influential people in Brazil going up against Moro" in court, said Vladimir Netto, a journalist for Globo News who wrote a definitive book on the case. "These guys are used to always winning, but they have not this time." Moro is also known as a stickler for even minor rules. While teaching in 1996, he warned law student Rosangela Wolff de Quadros that she'd be marked absent and might flunk his course if she skipped a Friday night seminar to attend a friend's wedding. "I detested him. Detested," Quadros told Netto for his book, Car Wash.
A few years later, when Moro was no longer teaching, the two began dating and wed. Today they have two children. 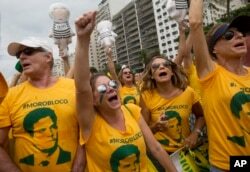 FILE - Demonstrators wear jerseys with the face of Judge Sergio Moro, who is heading the Petrobras investigation, as they protest on Copacabana beach in Rio de Janeiro, Brazil, March 13, 2016. That stern streak has led to less happy outcomes for defendants. Moro is famed for prying information out of suspects by imposing lengthy pre-trial detentions and prodding them into plea bargains that implicate higher-ups. That has helped turn what initially appeared to be a routine money-laundering case into a mega-scandal. The investigation launched in March 2014 and exploded later that year when Paulo Roberto Costa, a top executive at state oil company Petrobras, and Alberto Yousseff, who delivered huge sums of money to politicians and others, cut plea deals that unveiled the depth of the corruption. Piece by piece, Moro and a team of investigators revealed that top officials in construction companies such as Odebrecht, OAS and Andrade Gutierrez effectively formed a cartel handing out multibillion-dollar contracts that were inflated to pay kickbacks and bribes to scores of politicians. Moro rarely grants interviews and he declined to comment for this story. The son of two teachers, Moro grew up in Maringa, a city about 265 miles (425 kilometers) northwest of Curitiba in southwestern Brazil. After graduating in law from Maringa State University, Moro began working as a federal judge in 1996 while also earning a doctorate and participating in an exchange program for lawyers at Harvard University. Presiding over several money-laundering cases, Moro gained expertise with white-collar crime, and he took a particular interest in a massive corruption probe in Italy that ensnared many politicians there in the early 1990s. In a 2004 article for a legal journal, Moro noted the way Italian judges used plea bargains to advance investigations, keeping suspects in jail while their cases were processed and taking advantage of news media to shape public opinion. "Leaks serve a useful purpose," wrote Moro. "The constant flow of revelations keeps public interest up and party leaders on the defensive." Today, many legal experts see that article as a blueprint for his management of the Car Wash probe. 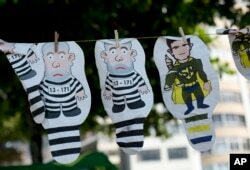 FILE - A set of inflatable dolls in the likeness of former President Luis Inacio Lula da Silva in prison garb and Judge Sergio Moro as a superhero hang on a line for sale during a protest against corruption and in support of the Car Wash investigation on Copacabana beach, in Rio de Janeiro, Brazil, March 26, 2017. Critics in the highly polarized country often accuse Moro of taking sides. Last year, he was sharply criticized for releasing a wiretapped conversation showing then-President Dilma Rousseff discussing the details of a chief of staff job for her mentor, former President Luiz Inacio Lula da Silva. That appointment, eventually blocked, would have removed Silva from Moro's jurisdiction because only the Supreme Court can decide whether to prosecute elected federal officials and Cabinet members. Moro defended the move in his legal decision, writing that "democracy in a free society requires that the governed know what their governors are doing, even when they seek to act within the protections of the shadows." Moro's judgments have hit those across the political gamut. Last week, he sentenced Eduardo Cunha, the former speaker of the lower Chamber of Deputies who led the impeachment push against Rousseff, to 15 years in prison. Moro's prominence has earned him numerous international awards, but he appears more put off by the fame than moved by it. His daily life is like it always was — though now with bodyguards. He jogs at a park, has long days at work, and his home life centers around family and a very small group of friends. "It's hard to know who is close to him," said Christianne Machiavelli, head of the press department of the federal courthouse in Curitiba, where Moro works. "His private life is very separated from his work life." Curitiba, however, is proud to claim him. Many in the city of 1.7 million have lawn signs and banners supporting the investigation and the judge. Interest in the case is so great that a tourism agency has begun offering tours that show the building where Moro works, artwork that has been seized in Car Wash raids and the jail that houses suspects. "Tourists often express their hope that Brazil is changing," said Bibiana Antonicomi, director of the tour company Special Parana. "When the investigation started, it was unimaginable that rich and powerful people would be arrested."